Seasoned Post Anesthesia Care Registered Nurse with many years of varied experience caring for patients at Level I. Added bonus of PAT and Level II experience within an ASC. I have used my expertise to assist in orientation of new employees, providing a caring and supportive introduction to the specialized care environment of the PACU. PACU staff RN 10/1975 to Present Mckenzie Willamette Medical Center – Springfield, OR From December 1990 to present: Primary care of patients arriving from the Operating Rooms with immediate support while waking from anesthesia. Care needs can include but not be limited to accessing interventions for respiratory assist and pain control as they occur, applying appropriate standards of care relative to patient need and age, assessments for intervention as necessary for patient and staff safety. We care for pediatric thru geriatric patients, including critical care level. 1975 to 1990: care of Labor and Delivery patients; newborn nursery and postpartum patients as well as gyn, urological and general surgery [female] patient. Staff RN pre and post op 09/2004 to 11/2006 Oregon Surgery Center – Springfield, OR Free standing ambulatory surgery center for urology. 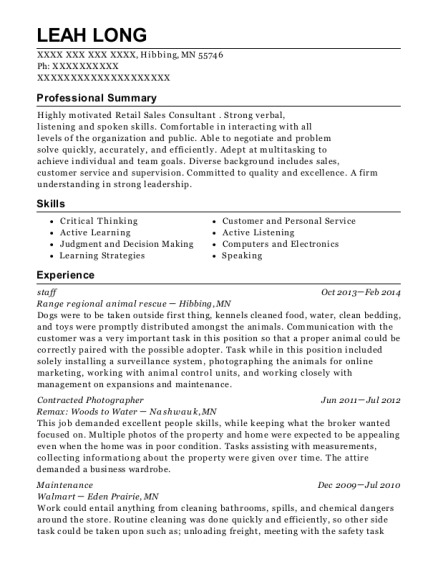 Job activity included Pre anesthesia interview, pre- operative and/or post operative care. Also assisted in procedure rooms. 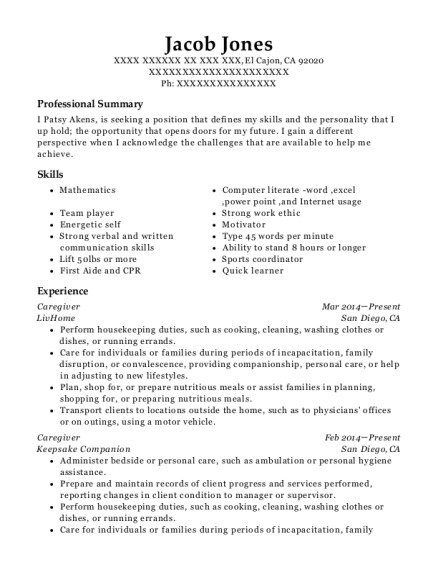 This is a resume for a PACU staff RN in Eugene, Oregon with experience working for such companies as Mckenzie Willamette Medical Center and Oregon Surgery Center. 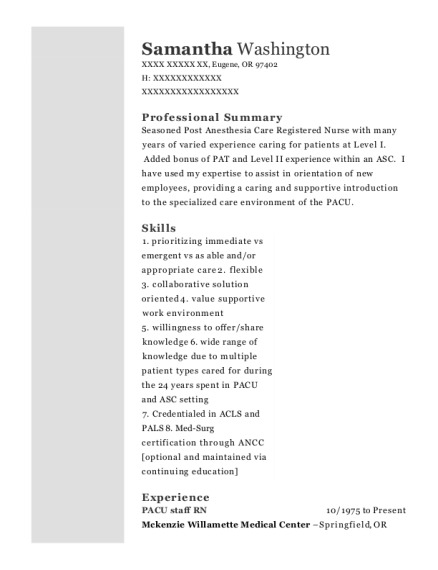 The grade for this resume is 0 and is one of hundreds of PACU staff RN resumes available on our site for free. 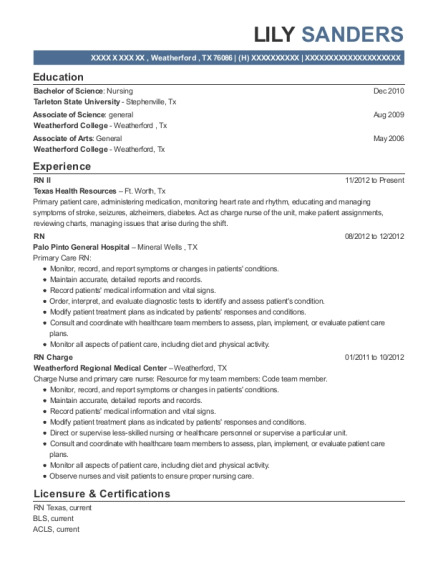 Use these resumes as templates to get help creating the best PACU staff RN resume.